Fiji plans to move more than 40 villages to higher ground to escape coastal floods and is also working on ways to help future migrants from other Pacific island nations as sea levels rise, Fiji’s attorney general said. Fiji, presiding at negotiations among 200 nations in Germany on ways to strengthen action to curb climate change that is melting ice from the Alps to the Andes, is working to resolve issues such as land rights and citizenship. “We have had to relocate people to higher ground -- we have moved three villages to higher ground and there are another 43 that are earmarked,” Aiyaz Sayed-Khaiyum told Reuters during the two-week talks that end on Friday. The first was Vunidogoloa, a village on Fiji’s second-largest island, Vanua Levu, where 26 homes were moved in 2012, he said. Apart from homes, authorities are also moving graves as settlements are moved inland. “Of course there are people who are uncomfortable about leaving their traditional, ancestral ares,” he said. He said it was unclear how many people would be covered by the programme. Fiji has also offered to help other Pacific islanders on low-lying island coral atoll nations. Fiji, with 900,000 people on hundreds of islands, is larger and has mountains rising to 1,300 metres. “We were the first to openly say we will give them residency or refuge in Fiji should rising sea levels make it inevitable,” he said. Worldwide, sea levels have risen 26 centimetres (10 inches) since the late 19th century, driven up by melting ice and a natural expansion of water in the oceans as they warm, U.N. data show. Seas could rise by up to a metre by 2100. The rise aggravates the impact of storm surges such as Cyclone Winston in 2016 that killed 44 people in Fiji and caused $1.4 billion in damage, a third of Fiji’s Gross Domestic Product. It also washes more salt water onto cropland. The Pacific state of Kiribati bought 6,000 acres (2,400 hectares) of forest land on Fiji in 2014. It might help grow crops in future, or provide a refuge if seas rise. 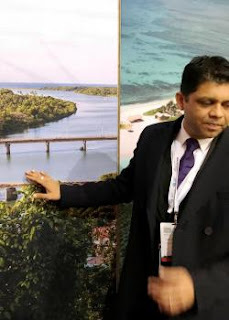 Sayed-Khaiyum, who is also the Minister of Economy, said Fiji has allocated $50,000 (US$25,000) to look into what he called the “peripheral legal issues” about climate change, such as how to grant residency or citizenship. Another is whether a nation’s exclusive economic zone, which stretches 200 nautical miles offshore, shrinks if a remote, outlying island is washed off the map.